So, how did we do it exactly? 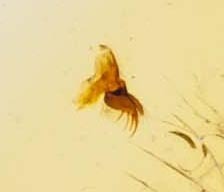 My first idea was to use the camera attached to the microscope to generate an image. But, sadly, the picture was too blurry and indistinct. Plan B was to use a light box and our nice Nikon D4 SLR camera on the copy stand. 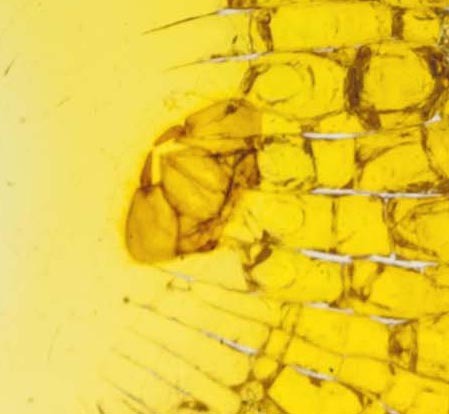 The massive resolution of the image files made it possible to zoom in and see the details of the specimens. 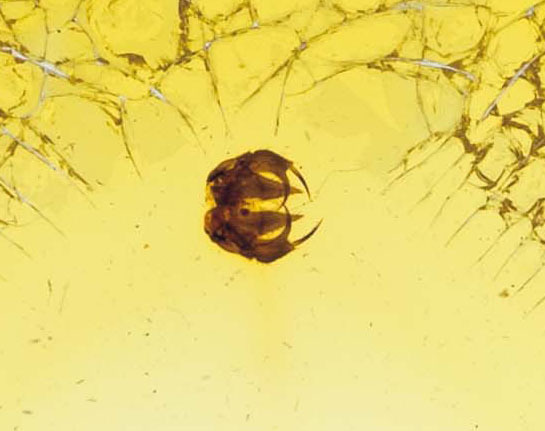 Without magnification the samples looked like tiny specs of debris. With magnification they were intriguing and presented a direct link to Ms. Heywood’s illustration work. Making sure the slides are organized and ready to go before reformatting starts. Positioning the slide so that only a minimum amount of cropping is necessary. Shooting raw files, at 600 dpi. The only alteration to the raw files was to crop the images and to save them as TIFFs. 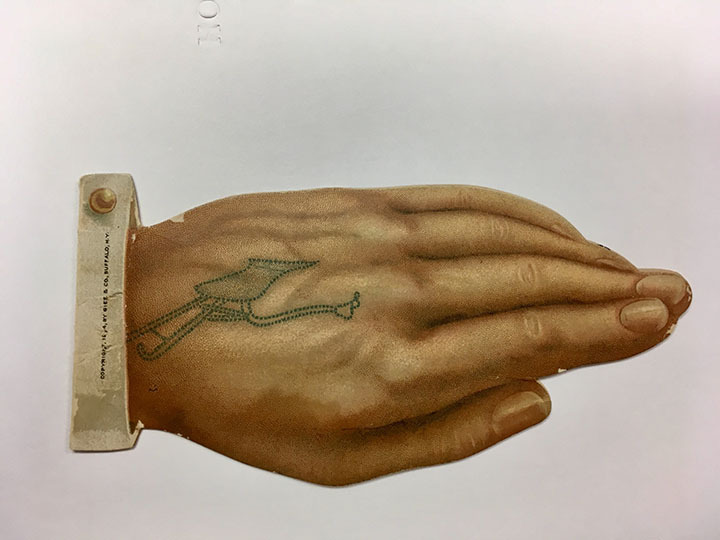 Another digital adventure, which promises to be ongoing for a while, is working with a comprehensive collection of ephemera related to farm machinery and equipment. 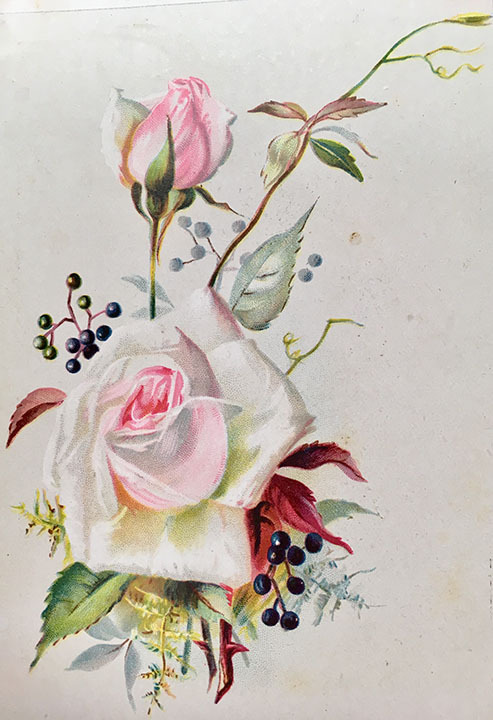 The cards, pamphlets and catalogs date from mid-1800s to early 1900s. This collection is frequently requested in the reading room by students and professors involved in courses on mechanical engineering, agricultural sciences and history of farming. 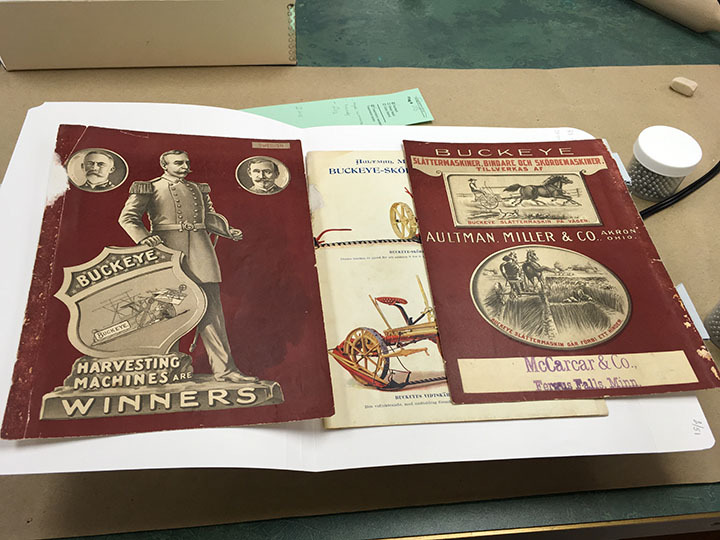 Archivists from ISU’s Special Collections have already written some blog posts about the Skromme collection: Ephemera in the Archives and Agricultural Machinery Product Literature. Party in the front. Butcher & Gibbs Plow Co., Imperial Plows advertisement card, date unknown. Business in the back. Butcher & Gibbs Plow Co., Imperial Plows advertisement card, date unknown. Powerful lady of multi-tasking. J.M. Childs & Co., Tiger Self Dump Wheel Horse Rake advertisement card, not dated. 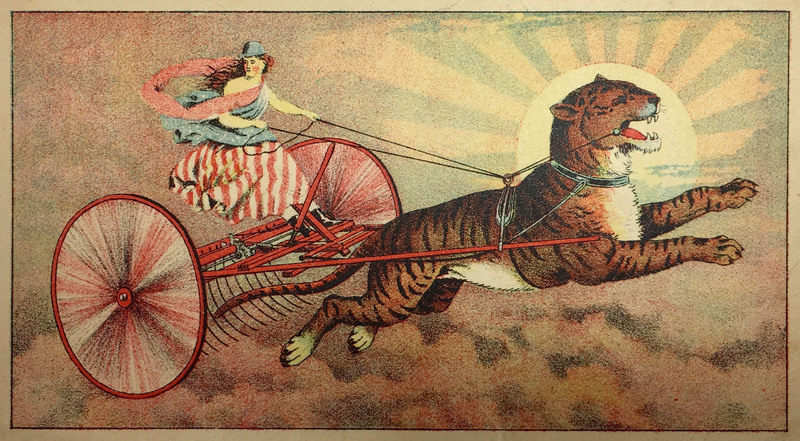 This image of a patriotically-clad woman riding a roaring tiger, while also managing to plow, has been very inspiring to me. Clearly, these objects need to be available online so a large number of people can see them. 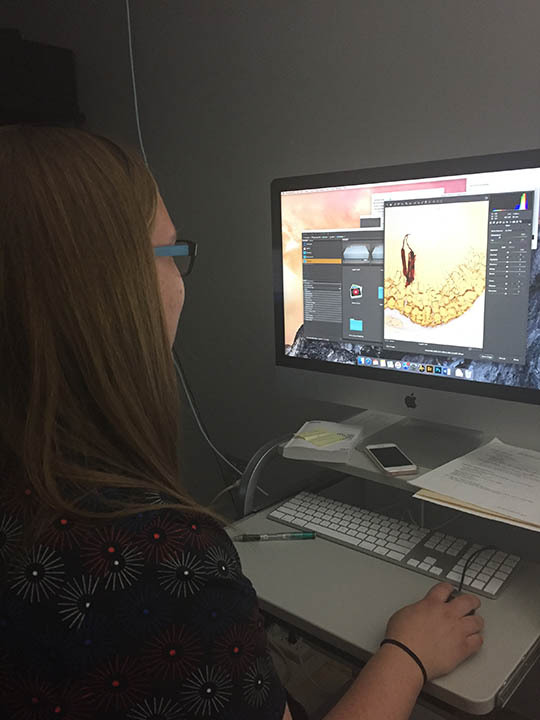 Working on several concurrent digitization projects requires collaboration, concise and clear communication and tight organization across department lines. Adopting a project management software tool has really enhanced our efforts. 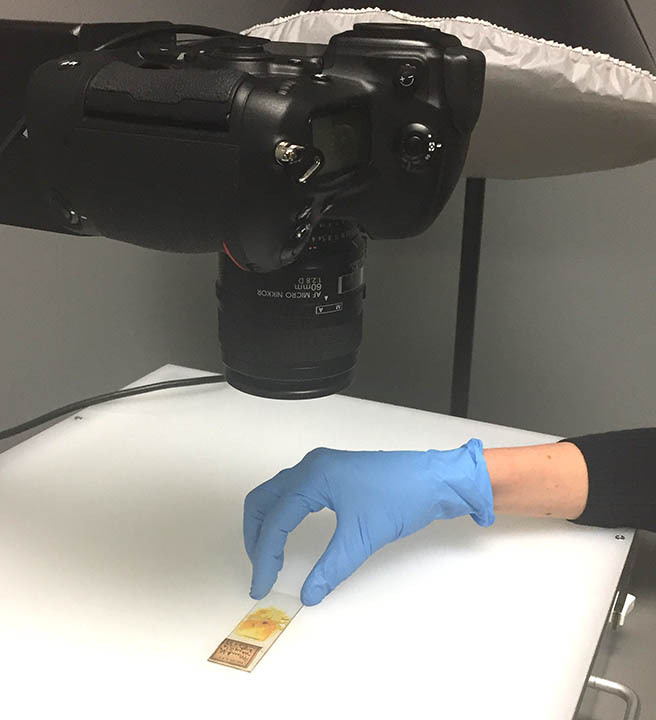 We use Meister Task to track progress of items as they pass through the Selection-Conservation-Digitization-Metadata pipeline. The software is easy to use and visually pleasing. I will even venture to say that using the interface is somewhat intuitive. 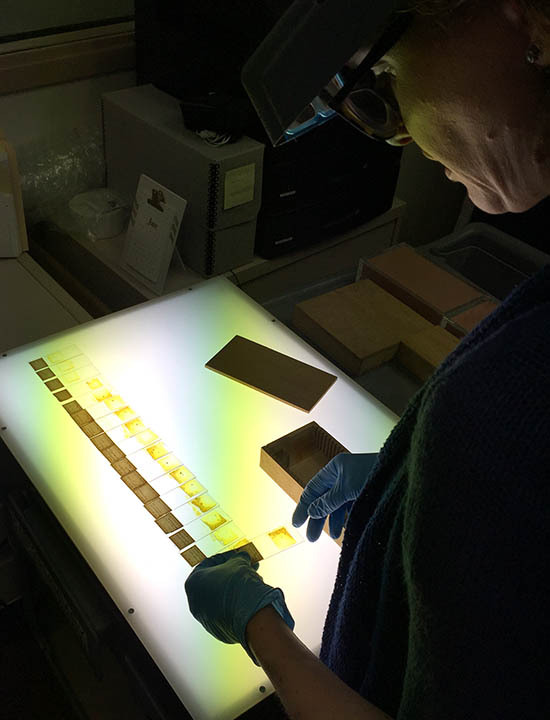 What about numerous conservation repairs that are needed to stabilize the super-fragile and damaged ephemera for digitization? My strategy has been to expedite without cutting corners. Using remoistenable (pre-coated) tissue has helped save time. One benefit is the quick drying time. 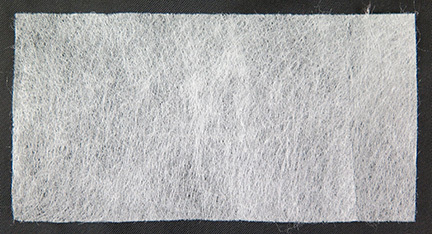 Another benefit is the ability to use 5 gsm or 3.5 gsm tengucho tissue with ease and expediency. The tissues are pre-coated with a mix of diluted wheat starch paste and 4M methyl cellulose, per handout from the 2009 LCCDG/ACDG session. Most of the paper that needs to be mended in this project is lightweight and fragile, so the thinner tissues are a good fit. For many of the pamphlets, the covers have become detached from the textblocks. 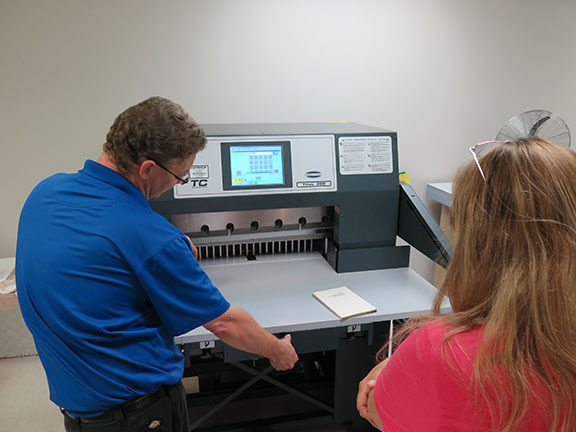 Since they will be digitized on the OpticBook book-edge scanner, which also functions as a flatbed scanner, it would not make sense to reattach the pages. The materials are archival and are meant for study purposes, not for display, so I consider toning fills to be unnecessary. Not attaching covers to textblocks; not toning fills. Aultman, Miller & Co., Swedish Buckeye Catalog, 1899. 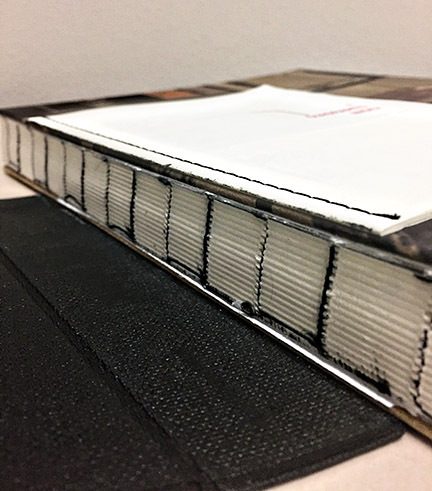 Some of the covers and pages that are detached are also very brittle and have numerous tears. It would take too long to mend them all and the page would still not be stable for handling because of its brittleness. 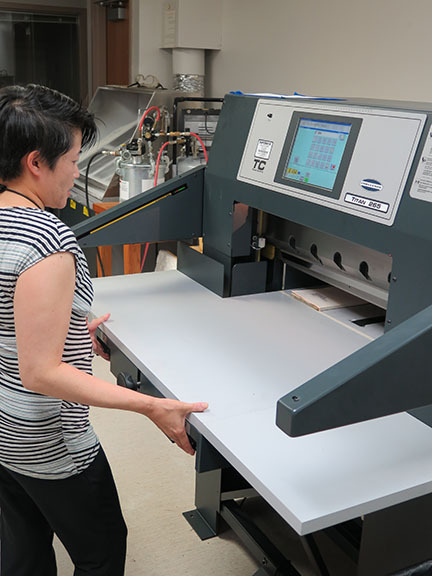 Enclosing a page in a Mylar L-sleeve and calling it a day is an acceptable treatment option because the item can be scanned directly through Mylar. Enclosing the cover in Mylar after mending significant tears; not mending numerous minor tears. 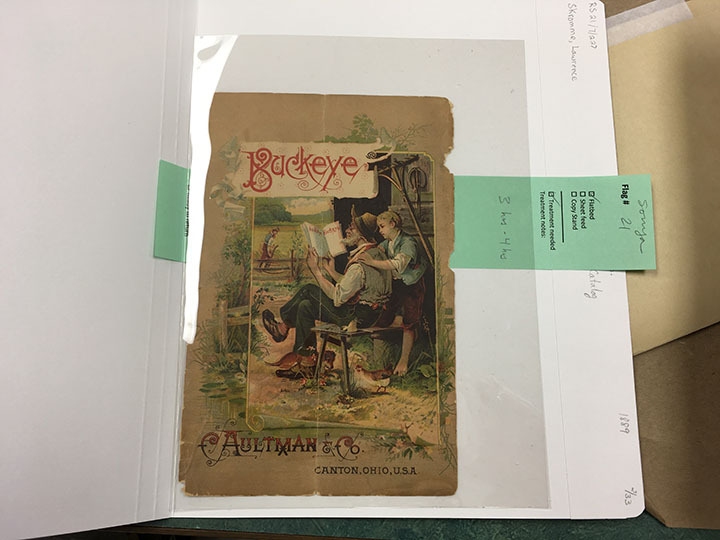 C. Altman & Co., Buckeye Annual Catalog, 1889. This is one of my favorite, most irresistible images from the Skromme Collection. The artists that worked for these companies were incredibly talented and imaginative. A cutout advertisement made from thick card stock. Bucher & Gibbs Plow Co,. 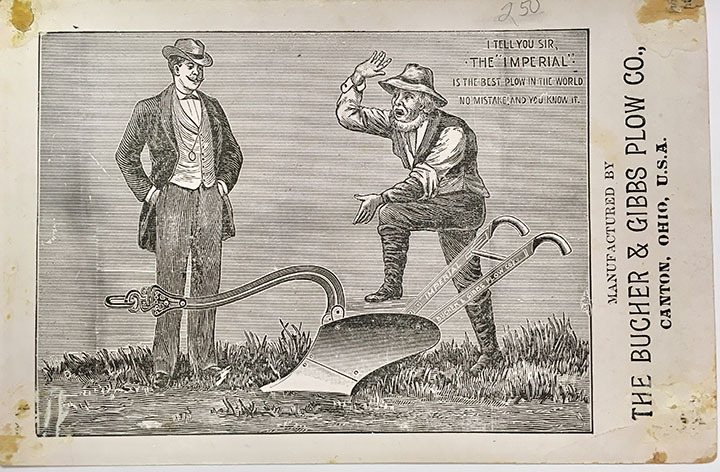 Imperial Plow advertisement card, not dated. Plow ink! who would have thought?? Bucher & Gibbs Plow Co,. 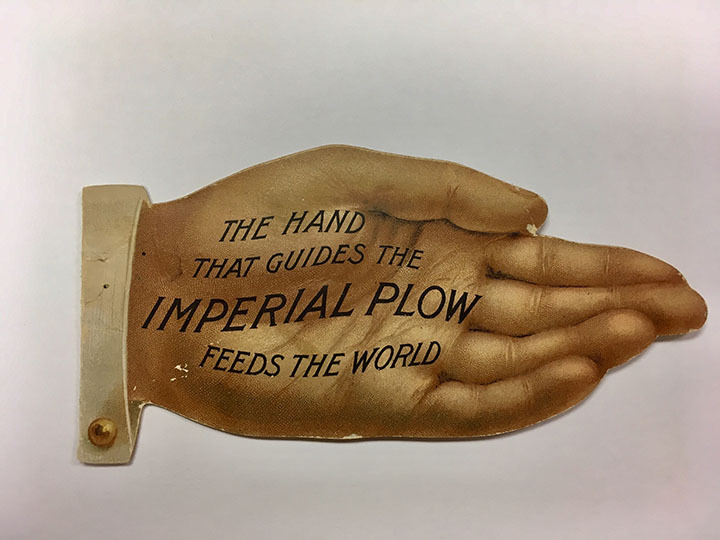 Imperial Plow advertisement card, not dated. As I mentioned earlier, certain signs of use are evident when examining the catalogs: fold lines, dirt, water damage, ink stains. But there are other signs as well, which I think of as “signs of life”. They are traces of people who inhabited the world with these paper objects. 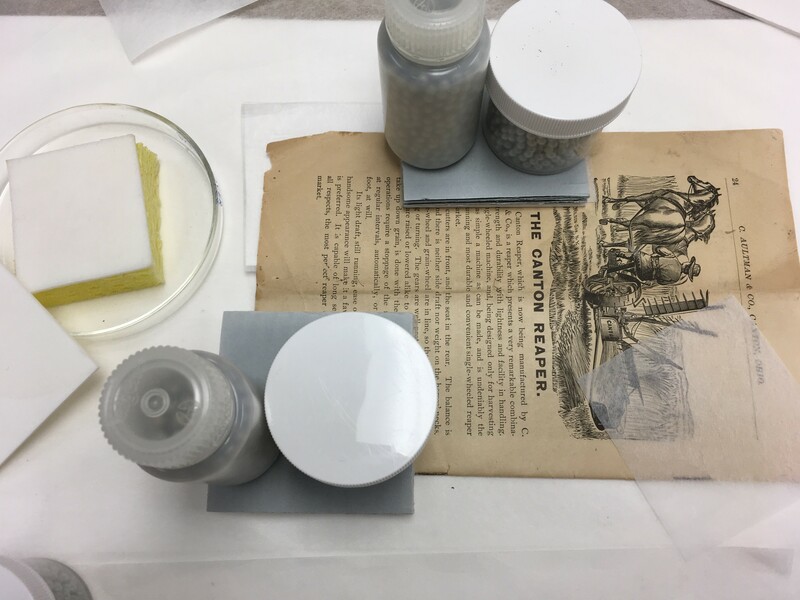 Even though the traces of personal history are not connected to a famous individual or a specific historic event, the altered paper objects do tell a compelling story about American farm life. Child adds some embellishments with colored pencils in the parent’s magazine. 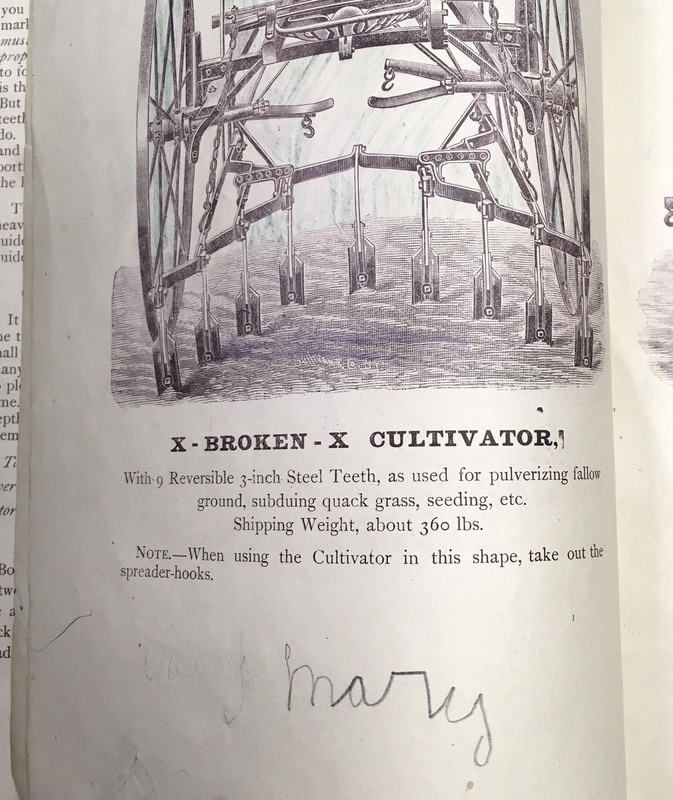 Charles H. Childs & Co., Riding Cultivators Catalog, 1892. The culprit’s signature on the other side of the page. 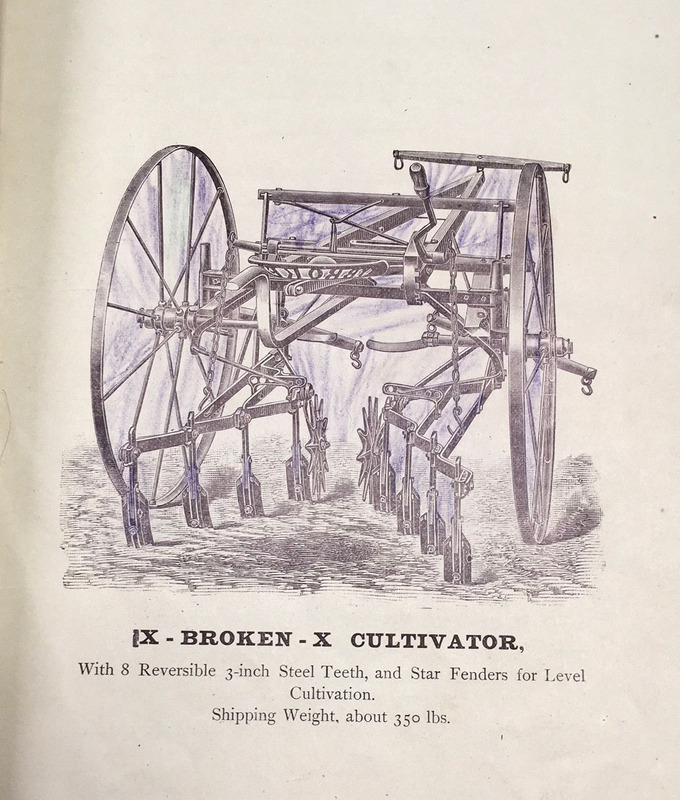 Charles H. Childs & Co., Riding Cultivators Catalog, 1892. 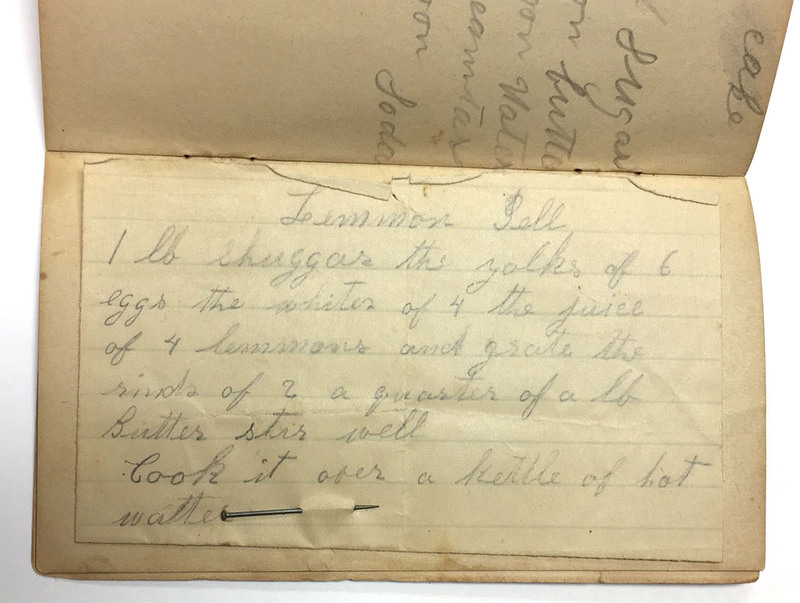 A page with a recipe is attached to the inside of the pamphlet, using a nail. J.M. Childs & Co., Tiger Self Dump Wheel Horse Rake memorandum book, 1884. 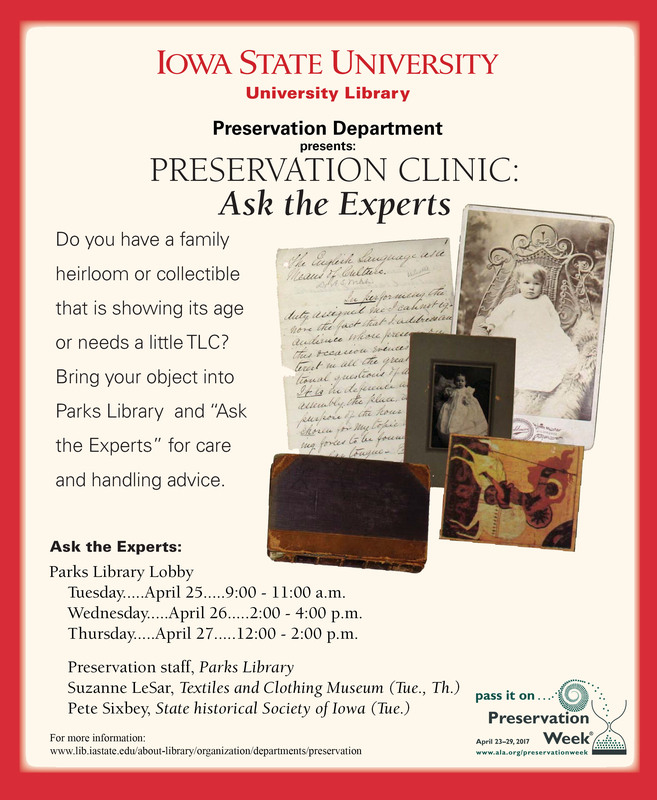 Next week here at the ISU Library we will be celebrating Preservation Week! It’s a wonderful time that we can devote to reaching out to the community and educating them on what we (and they) can do to preserve our personal and shared collections. 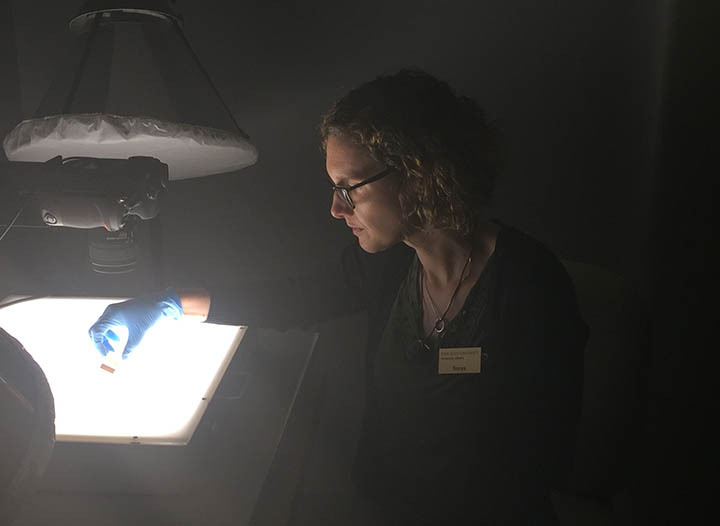 This year we will be hosting another Preservation Clinic: Ask the Experts that is open to the public. We invite those that are local to bring in a family heirloom or collectable and we will provide you with information on how you can properly care for and handle your item. We will be joined by some guest experts from the State Historical Society of Iowa as well as the Textiles & Clothing Museum. We will also have a representative from Digital Initiatives available to discuss our digital collections and the new Bomb transcription project that you may remember from our previous post. If you are in central Iowa next week we invite you to come and join us and if you aren’t local I encourage you to check out the Preservation Week website for a lot of quality information on protecting our treasures! It’s like a box of chocolates…. You never know what you are going to get. As an artist myself I can appreciate art books and books with unique characteristics but let me tell you that when they enter the lab we usually groan. These books are often neat and unique and creative but more often than not they just don’t hold up well. Take for instance the most recent one to enter the lab – and funny, check out the title. 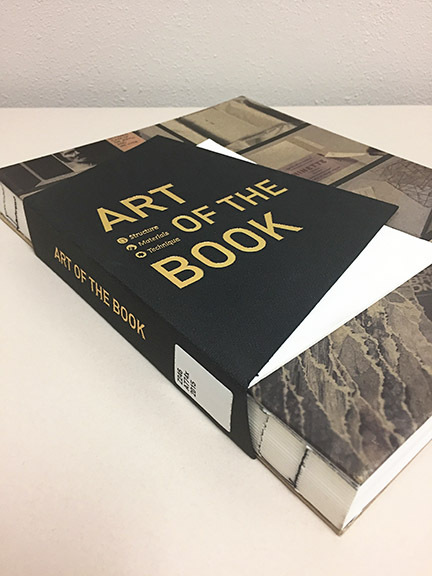 This book looked fine on the outside but when we opened it we realized the cover of this book had separated itself from the text block. A fairly easy fix by our technician and she also constructed a box for it to give it some protection since this item will be in our general collection and may get used a fair amount. Curious if you see items like this in your repair work and how you feel about them. The rest are all filled with either 4.5 mm BBs or mini BBs. 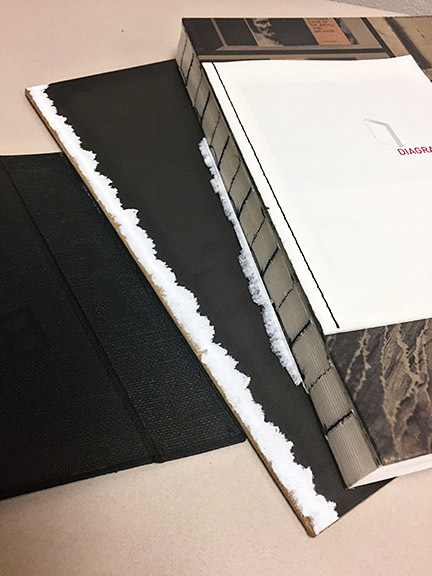 On the right is another acrylic “block” with mini BBs in it and to its left shows a BB box, one covered in binder’s board, and the middle one covered with book cloth. In front are 2 oz. bottles filled with both mini and 4.5 mm BBs. The mini BB bottle weights much more than the 4.5 mm BBs. The little flat top 2 oz. bottle are the latest additional to our weights. We like these as they are small for little jobs yet we can stack them for more added weight. What we don’t like is when an acrylic block is dropped to the floor, it shatters, and BBs roll everywhere in the lab and you find them for months afterwards! Next we have cloth covered BBs, metal washers, and flexible metal strings for more sensitive work and holding down pages in a book. Then we have heavy metal plates with handles that remind me of a bacon press, nickel-plated steel bars that are small and extremely heavy, and glass blocks with safe edges which you can see your work through. Lastly is my collection of weights filled with 4.5 mm BBs. Something as simple as a Beanie Baby toy can be gutted and filled, a plastic Minion toy, and even my duck needle holder has BBs in it to help hold it upright but also can be used in a very small area needing weight. I like using the Beanie Babies when I am sewing the folios of a book back together. This also gives you something fun to look at on your lab table and also for entertainment when guests come for a tour and I tell them to pick up a Beanie and they are surprised by the heavy weight. And of course I must have a Baby Cy weight too! Last fall we were made aware of the University’s new “mixed stream” recycling program. This new system allows for all sorts of recyclable material to go into the blue bins – newspapers, pop cans, white paper – all together in the same bin! No having to search around for the proper bin for each item. 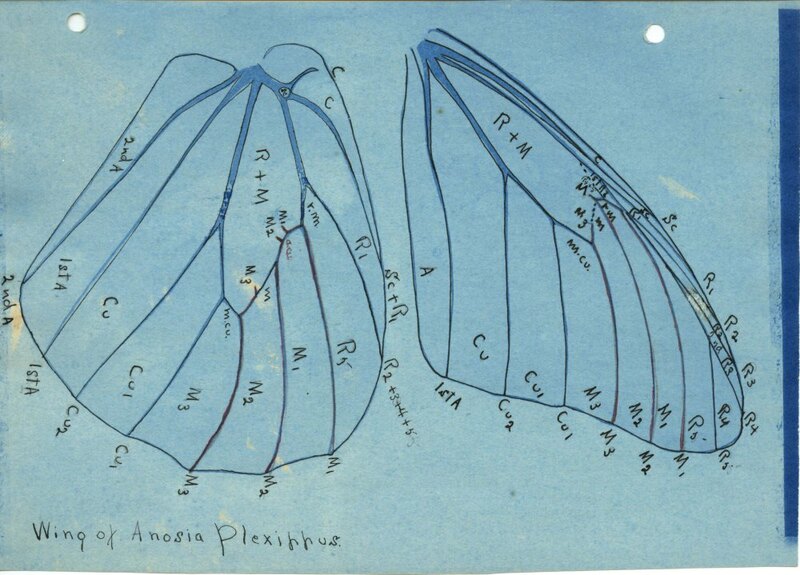 This got us in the Lab thinking – what about our scraps that we throw out? Can we recycle what we use? 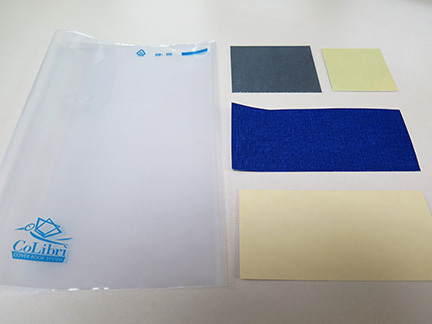 We gathered up items we use frequently in the lab that we thought might possibly be recycled and had the person in charge of the recycling team come and talk to us about these items. We were pleased to hear that much of what we use can be recycled! One of the funny things discussed was Reemay – not really recyclable we are told. Even though we know what it is and what it is made from the people at the sorting facility would most likely think that it is a dryer sheet which is not recyclable. Ha! 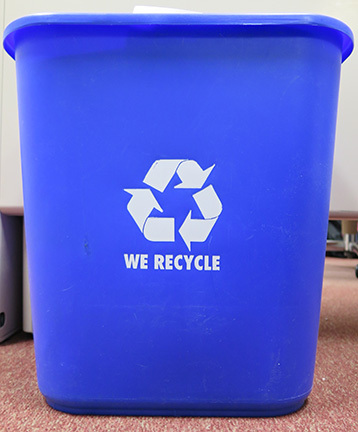 Here are just a few of the items that we most frequently recycle. 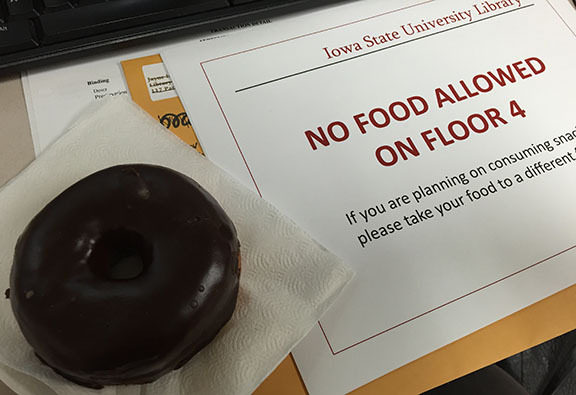 A few weeks ago the Iowa State University Library implemented a new policy concerning food in the building. Previously food was only allowed in a handful of designated areas of the library. Well now you can enjoy that bagel & cinnamon roll pretty much anywhere in the library except for the 4th floor. Why not the 4th floor – what’s so special about the 4th floor you ask? Well that happens to be where we (the Preservation department) and Special Collections and University Archives are located. We are hoping that this will help in protecting our unique collections that are housed on the 4th floor from unwanted critters. So far we have only encountered a handful of patrons who seemed oblivious to the numerous signs & table tents so I would count this as a success so far! 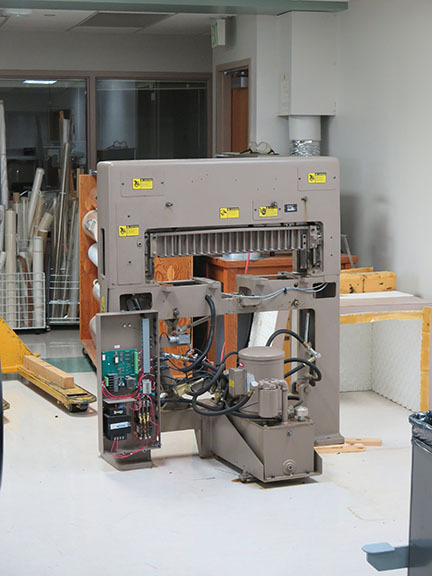 The time had come, our trusty ol’ guillotine could no longer be called trusty since a part had been recalled which made our machine not usable. 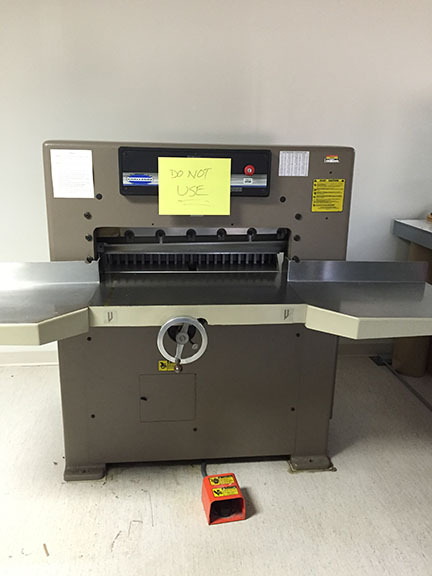 This beast had been with the lab for quite sometime and had been used almost daily. We were a bit sad to see it go but it’s time had come. Skip ahead 4+ months and we finally received our new Titan 265. We were all very excited at it’s arrival! 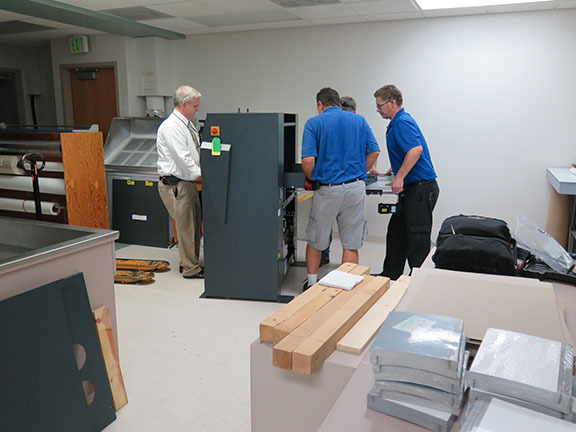 It took 4 guys a full day to disassemble the old guillotine, haul it out and bring in and assemble the new one. The new machine has a digital screen which is new to us. 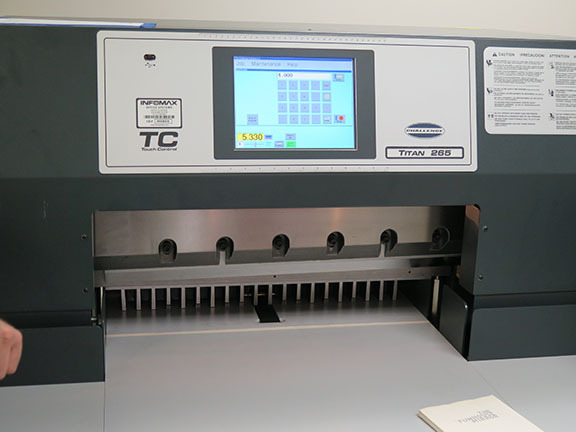 We have the option of turning the dial to set the gauge on where to cut or we can punch the number in on the screen. And it can do the math for us if needed – for example – if we are wanting to cut streamers from a stack of 8.5×11 paper we can type in 8.5/5 and it will cut 5 equal stacks for us! So neat! This one is also quite a bit quieter than our last one which our ears thank us for. Training was really quite simple, with the new touch screen most of it is self explanatory. We were all anxious to give it a try! 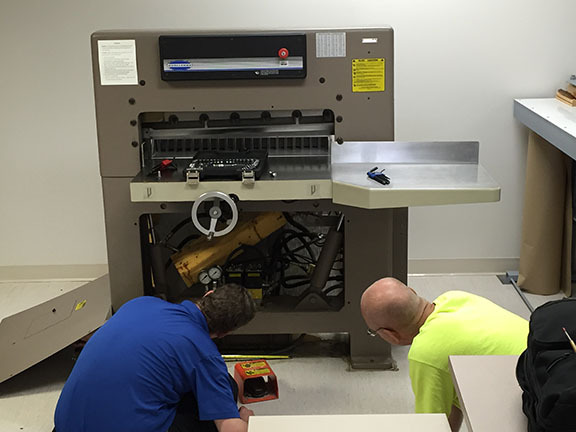 Getting trained on the new machine. Hilary giving it a try. We have only had it for a couple of weeks but we have already put it to good use chopping away – here’s hoping for many more years with Mr. Titan!